When your chainsaw has lost its verve for tearing and slashing, it may be time to replace the workhorse that makes it roar. Typical chains revolve around the saw's bar at 50 feet per second. That's a lot of room for friction, and the subsequent heat that all rubbing causes. This will wear out your chain quickly if you don't perform regular maintenance. A bad chain can turn into a serious problem if it flies off the bar or simply puts you in a spot where your saw has quit but the project is dangerously incomplete. Those biting blades on the chain take a beating each time you use your chainsaw. The process of replacing it should only take a few minutes once you have the basic details down and safety precautions in place. The teeth on a chainsaw are preceded by a small rectangular piece of metal called cutters. Their job is to score the wood so the tooth can more easily slice through it. If your chainsaw is getting more difficult to use, you'll feel tension in your arms as you work through big projects. The chain keeps its tension with a bar tensioner screw. The teeth are held together with tie straps, which in turn connect two teeth and helps to redistribute all that cutting force over all those straps. If the chain begins to look gnarled with broken or completely missing teeth, it's time to completely replace the chain before it puts you in a perilous situation. 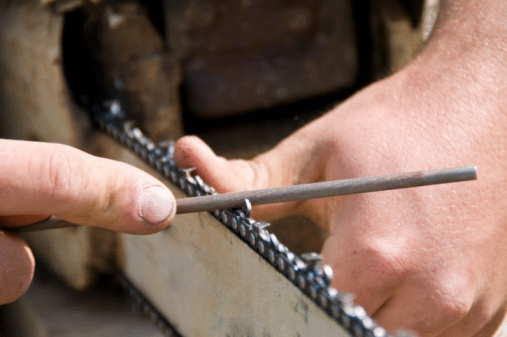 If the chain sags when you turn the saw on, immediately turn it off and replace the chain. The sag is an indication that the chain ties are damaged and the entire chain can fly off. Most manuals recommend that you refuel and sharpen the teeth of the chainsaw after each use. If you do this, it could also wear down the teeth at a faster pace. Occasionally check to see that the teeth aren't too small. This can be a danger to you as smaller teeth have a tendency to chip off the chain and fly into your face. Remove the guide bar side panel with the wrench that came with your machine or a socket wrench. If there is a brake attached, unlock the brake before you remove the sprocket plate so you don't damage the brake. Once the sprocket plate is off, the chain should be limp. Simply pull it off the front of the blade first to release it from the tensioner. Loosen the tensioning screws when the chain is off so you can carefully and more easily thread the new chain around the clutch drum. Check that the drive links are making contact with the sprocket. Wrap the chain around the nose and align the bar by pulling on the tip away from the main casing of the saw. Place the guide bar neatly into the adjustment pin and replace the side plate. Adjust the tension with the tensioning screw.